There is no other place in the world where getting married and live the same romantic and magical atmosphere of Venice. 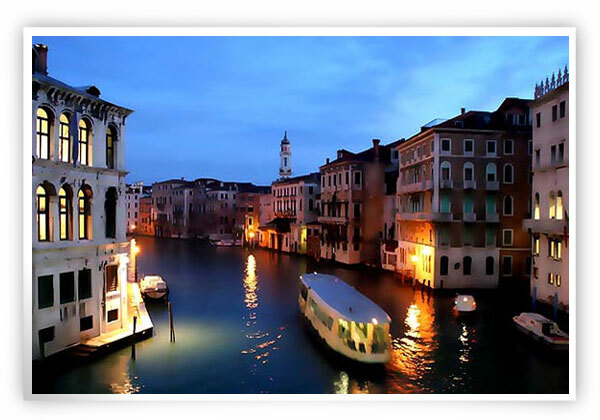 Venice is one of the most visited cities in Italy for its particularity, it is a city built entirely on water. There are a lot of historical monuments and best of all…there are no cars! The narrow streets of Venice are called “calli ” and invite exploration on foot and its canals and its old bridges are an inimitable scenery, unique in the world,so a perfect setting for your wedding . It is possible to marry in Venice in a Civil or Religious ceremony . Civil weddings in Venice are celebrated in several settings but the most requested is the Palazzo” Cavalli “on the Grand Canal. The famous upstairs balcony has direct views of the Rialto Bridge and it is possible for the bride and groom and guests to arrive in a beautiful wedding gondola or motorboat. Catholic weddings in Venice can be celebrated in many of the stunning churches and basilicas throughout the city including the Cathedral of St. Marco , the church of San Giacomo Dell’Orio, and the Church Dei Miracoli . Symbolic weddings in Venice are one of the most requested types of ceremonies and the choice of options is certainly one of the best in Italy. Many couples choose to marry on a gondola which is as romantic as it gets! We will arrange for an celebrant to perform your wedding ceremony and a musician is certainly recommended. The ceremony is particularly beautiful at sunset with the shimmering light reflected on the waters. After the ceremony, your gondola ride will continue throughout the city’s most scenic locations with the photographer. Planning Sorrento wedding planner have selected many exclusive locations and venues, gardens for an enchanting wedding ceremony and they are very glad to share with you their professional experience and help you to plan a perfect and unique wedding. Couples desiring to have a Protestant wedding in Venice can choose to marry in one of the Protestant churches or request to us a pastor to perform a ceremony in one of the luxury hotels or charming gardens . Planning Sorrento has selected the most charming and elegant hotels and exclusive restaurants where to organize your wedding reception in Venice. 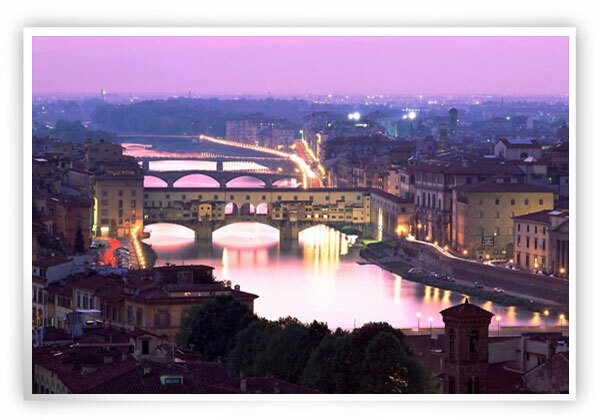 Florence is one of the most beautiful cities of Italy it is full of art and historical monuments and millions of visitors arrive each year to visit this splendid city that is a romantic setting for your wedding ceremony! Civil Weddings in Florence are held in a Medioeval Castle “Palazzo Vecchio” and exactly in the “SalaRossa” that is an unique example of the beauty of Reinassance art that make certainly this location a magnificent place to perform your wedding ceremony. Catholic ceremony are available in many historical churches located in Florence, one of great historical value is the Church of Santa Trinità a church in Reinassance style located in the centre of the city near the Arno River. Couples desiring to have a Protestant wedding in Florence can choose to marry in one of the Protestant churches such as English Protestant Church or Episcopal Protestant Church or request to us a Pastor to perform a ceremony in one of the luxury hotels, Medioeval Castles or charming gardens . Planning Sorrento has selected many venues, exclusive hotels and private villas for perfomingSymbolic ceremony. We can realize with you a tailored symbolic ceremony suggesting you beautiful readings and vows and some soft music to create an elegant atmosphere and a magical wedding ceremony. Planning Sorrento has selected the most charming and elegant hotels and exclusive restaurants where to organize your wedding reception in Florence. 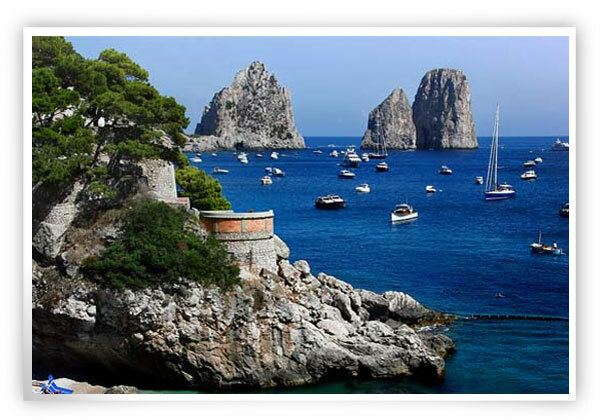 Capri is one of the most famous and enchanting islands of the world and it is a great rock that soars like a dream lost in the cobalt blue sea that surrounds it. It is one of the Mediterranean jewel that with its peaceful charm, its splendid fragrance of flowers, its magnificent panorama and the blue sea is considered a romantic location for your wedding in Italy. In ancient times Capri enchanted Phoenicians, Greek and Romans and it is common knowledge that Caesar Augustus loved this island and Tiberius spent in Capri the last years of his life and built 12 villas. Capri becomes very famous with the discovery of the “Blue Grotto” and millions of visitors arrive each year to visit this splendid magnificence. Capri island has two towns: Capri and Anacapri in which it is possible to celebrate Civil wedding ceremonies. The Town Hall of Capri is located in the centre exactly in a room facing the “Piazzetta Umberto I” while Anacapri Town Hall has an impressive gardens with a breathtaking view on the sea. Symbolic and Protestant ceremonies can be performed on the terrace of a 5 star luxury hotel or in a private villaor on a splendid boat. Planning Sorrento has selected so many locations and will help you in the choice in accordance to your needs and desires. Catholic weddings in Capri are not available because the bishop of Capri has ruled that only Italian nationals can be married in the island's Roman Catholic churches. Planning Sorrento has selected the most charming and elegant hotels and exclusive restaurants where to organize your wedding reception in Capri. Rome is the Capital, the Eternal city, wherever you turn you are surrounded by centuries of antiquities, monuments, magnificent Basilicas and Churches and above all… beauty! Rome is the most charming and enchanting cities of the world, its famous sights such as the Colosseum, the Spanish steps, the Trevi Fountain are a perfect settingfor your wedding! 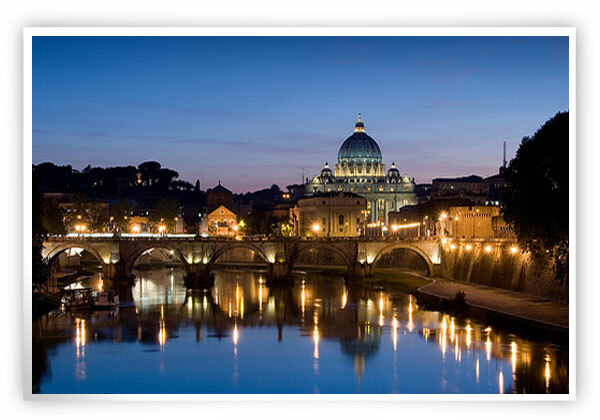 A wedding in Rome offers options for everyone whether you are planning a Civil, Catholic, Protestantor Symbolic wedding. Civil weddings in Rome are celebrated in three different wedding halls: Campidoglio, Caracalla. Thesetwo locations are very different. The Caracalla wedding hall used to be a Convent and is situated in the historical centre of Rome and it is surrounded by a vast gardens.Less elegant and formal than the Campidoglio, it has a more charming and rustic feel. The Campidoglio wedding hall is right in the centre of Rome overlooking the Roman Forum and is quite formal and elaborated with enchanting and amazing ceilings. If you are considering of getting married with a Catholic wedding we inform you that Catholic weddings in Rome can be celebrated in many of the city’s great historical churches including a Chapel inside the Vatican. Rome is the cradle of Catholicism and the city is so full of splendid and enchanting churches that makes the choice superb but we has selecting the most charming churches where to celebrate your wedding in Rome and we will be very glad to support you in the choice of the church. For your Rome wedding reception we have selected a big variety of locations, exclusive venues, luxury hotels, famous restaurants and private villa, there are options for every taste. The area surrounding Rome is famous for its spectacular castles located in panoramic settings that will take your breath away. These castles and villas are also perfect for planning a Protestant or Symbolic wedding in Rome. Planning Sorrento has selected the most charming and elegant hotels and exclusive restaurants where to organize your wedding reception in Rome. Sorrento is the ideal place for your wedding! The town is located on a tufa terrace with sheer rocky cliffs which fall straight down to the sea. The beauty of the site and of the spectacular landscape, the flourish citrus groves, the immensity of the panorama over the gulf of Naples, Vesuvius and the extraordinary blue of the sea make this city a perfect setting for a romantic and unique wedding. Civil weddings in Sorrento are celebrated in the Cloister of San Francesco built in the VIII century that is a historical place where there is a fusion of different architectural styles that create a magical atmosphere for the ceremony. In this town there are some exclusive hotels with panoramic terraces that are available for performing Protestant or Symbolic ceremonies. Catholic ceremonies are not available. Planning Sorrento has selected the most charming and elegant hotels and exclusive restaurants where to organize your wedding reception in Sorrento.